We had another book-filled day at bookworm camp! We continued talking about Breadcrumbs this morning and had a great conversation about Hazel and Jack. It led to researching Montessori schools, forest kindergarten, school closings in Minnesota, Grimm’s Fairy Tales, Hans Christian Anderson, and age-appropriate behavior. We talked for close to an hour! Then we watched Pixar’s “The Little Match Girl” short from a few years ago. After that, we dove into learning about how books go from an idea in someone’s head to the printed book in the bookstore. We talked about agents and slush piles, editors and publishing houses. Then I shared Kate Messner’s Revision Gallery presentation with them. They sat at the tables in amazement as we looked at the revision process through the eyes of real authors. None of the campers had any idea that authors spend months revising their work. And they felt better about their own writing when they saw the grammar edits and “show don’t tell” comments on many of the drafts. I can’t thank Kate enough for the presentation because it is always enlightening for my kids. Once again, we read 30 pages of Liar & Spy before lunch. I can’t recommend it enough. It’s a great read aloud for middle school students! After lunch, we spent an hour reading our own books. It was absolutely glorious. When I announced that it was time to move on, they actually groaned! It’s a dream spending time with students who love reading this much! Finally, we watched most of Chip Kidd’s TED talk, “Designing Books is No Laughing Matter. Ok, It Is“. (There are no words to describe my love affair with TED talks.) Chip Kidd is a well-known and respected book cover artist and his TED talk is funny and thought-provoking. The campers really loved it and we had a great conversation about book design afterwards. I shared this tumblr with them and we discussed redesigning book covers for new generations. And we took a look at some of Melissa Walker’s Cover Stories to learn about the process behind some of their favorite books. I think they learned a lot and they really enjoyed it. Looking forward to continuing with my campers tomorrow. This week is flying by! In her small Texas town, Lacey Ann Byer has a reputation. She’s a good girl. Her father is the local preacher and she is expected to live up to the ideal of “preacher’s daughter”. But that’s never been a problem for her. In line with being the good girl in town, she has never wished to be the most popular or the prettiest girl. But this year, she wants to shine. For the first time, she is old enough to try out for the most difficult and highly lauded character in the church’s annual Hell House- abortion girl. The annual Hell House is her church’s way of teaching young people about the dangers of sin and it draws visitors from the surrounding towns. Then things change when Ty moves to town. He and Lacey grow close, but his questions cause Lacey to start thinking deeply about her own beliefs and faith. I loved Small Town Sinners. It is unlike anything I have ever read before. It’s a book about religion without being heavy-handed or preachy. Religion plays a major role in the plot, but it doesn’t read like a “religious” book. Lacey is easy to relate to and all of the characters are real. They aren’t caricatures of people with faith (which is something I see in some YA books). They are who they are and they ring true. And despite being the preacher’s daughter, Lacey is a normal teenage girl. She is trying to figure out who she is and where her place in the world is, all while trying to live up to the ideals set by her parents. A fantastic read for anyone interested in contemporary YA. I would recommend this to fans of Sarah Dessen. 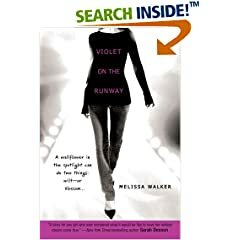 Fans of Melissa Walker’s Violet on the Runway series will also enjoy her newest book. Highly recommended. And how awesome is this cover? A++++! I am a nosy little bugger who loves getting the “inside scoop”. That’s why I loved YA author Melissa Walker’s series this week, Cover Stories. Every day she interviewed a different author about the story behind their book’s cover. Every story is different and each one is fascinating. I had no idea that some cover models are used on more than one book! Or that the models themselves don’t always know when their likeness has been used. Melissa Walker interviews Sarah Dessen about the cover for Along for the Ride, Siobhan Vivian about Same Difference, Beth Kephart about Nothing but Ghosts, Jenny Han about the cover of The Summer I Turned Pretty, and Sara Zarr about Story of a Girl and Sweethearts. So cool! Plus, you can enter a contest each day to win a copy of the author’s book. And don’t forget to check out Melissa Walker’s newest book, Lovestruck Summer. Violet Greenfield wants nothing more than to be able to fade into the background of high school. Unfortunately, her height makes that almost impossible. To compensate for her long legs and ever-growing body, she tries to dress inconspicuously and avoids drawing any attention to herself. Even her job, at the small hometown movie theater is designed to keep her hidden- anyone in their right mind (even Violet) goes to the megaplex across town to see a movie. In Violet on the Runway , Violet’s life is forever changed the day she meets the woman in Chanel glasses at the movie theater. In the midst of complaining about her movie-going experience, the woman is stunned by Violet and hands over a card for Tryst modeling, asking if Violet is “signed anywhere”. Violet accepts the card, but laughs it off. However, over the next few days the card burns a hole in her pocket. Is this woman, Angela, right? Could she possibly be model material? She eventually decides to take the plunge, which takes her and her mother to New York for go-sees, appointments with designers. When four designers choose Violet to walk their Fashion Week runways, she is suddenly thrust into a whole new world. Is modeling all that it’s cracked up to be? Can Violet survive being a runway model, the next “It” girl, and a high school senior? Can her life back home and her relationships with friends and family stay intact? Most importantly, can Violet survive, intact? I really enjoyed this book! It was a great look at the world of modeling and glamour, but with a likable heroine. Violet is genuine and real, you feel like you know her. She struggles and makes mistakes, but you don’t blame her. She just wants to be something more than P-L-A-I-N. And really, isn’t that what we all want in middle school and high school? I plan to recommend this to students who enjoy THE CLIQUE novels and Meg Cabot’s AIRHEAD. And I am thrilled that it is perfectly acceptable for 6th graders. I often have a hard time finding acceptable readalikes for these books, and Violet on the Runway fits the bill. Even better? It’s a series (be sure to check out Violet by Design and Violet In Private )! 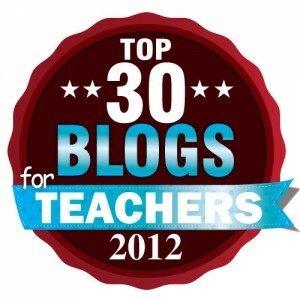 I already sent a recommendation to a few of my former students who I know will enjoy Walker’s books. This month, Melissa Walker’s Violet books are the pick of the month at readergirlz. And there’s more! I was excited to see an opportunity to win a signed copy of the book on Hope’s Bookshelf. And the author, Melissa Walker, is having a release month party on her blog where she is giving away a book she has read and loved every day. The grand prize is going to be signed copies of the Violet trio.